Skiathos (Greek Σκιάθος) is a small island in the Aegean Sea and it belongs to the island complex of Sporades. 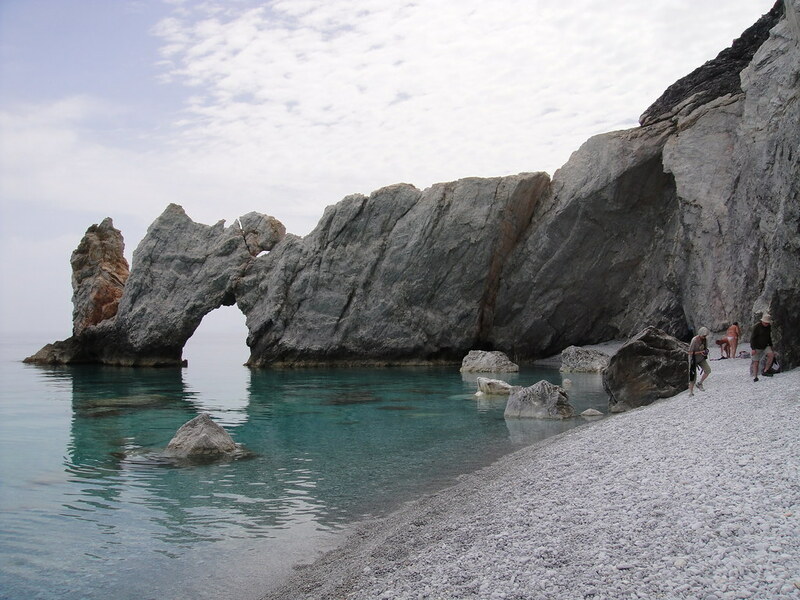 It belongs to the prefecture of Magnesia and it has 6,160 inhabitants as of 2001. Skiathos (σκιά+Άθως) probably took its name owing to its geographical position, as being in the shade (Greek σκιά, pronounced skia) of Mount Athos (Greek Άθως). The main characteristic of Skiathos is that it is a rather forested island, as opposed to most other islands in the Aegean Sea (e.g. the Cyclades island complex), with vegetation (mainly Stone Pines, Aleppo Pines and olive trees) reaching the seashore, creating a magnificent scenery. Skiathos is very well-known all around the world for its beautiful beaches, such as Koukounaries (also known as Chrysi Ammos=golden sand beach), Banana, Megali Ammos, Aselinos, Lalaria, Achladies and many others. Skiathos is also one of the main places, where the famous film Mamma Mia was filmed. The blue markers shows the location of various accommodations in Skiathos. The letter in the marker describes the accommodation types: H for Hotel, A for Apartment, R for Resort, B for Bed & Breakfast and O for Other (e.g. pension, villa). Click on the blue marker for more information on the accommodation.